Active Bucks has been designed to help Bucks residents become more active – particularly people who are currently inactive or haven’t been active for a while. The Active Bucks website holds over 2500 weekly activities that you can search by distance, day/time and type of activity. Why not join a Beginners Jogging group or give Yoga/Pilates/Tai Chi a try, or find something for the kids/grandchildren? There are even activities that get you more active as a bonus of taking part such as Photography Walks or Allotment programmes. Register to download a voucher that lets you try your first session for FREE! Visit www.activebucks.co.uk to find fun, affordable activities taking place near you! Too many of us are not doing enough physical activity to benefit our health. 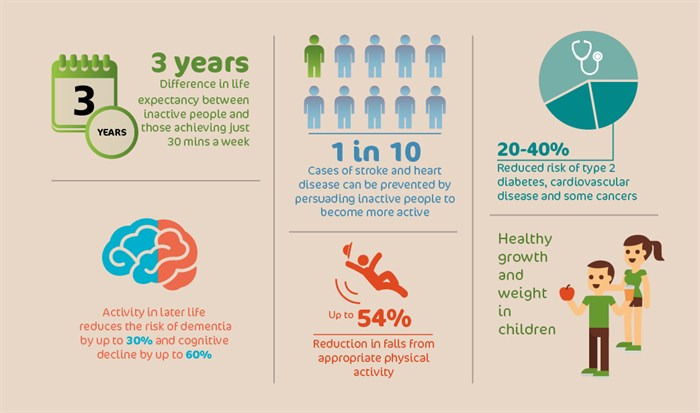 This means we’re missing out on all the other benefits being active can bring, such as reducing our risk of disease and disability, becoming more independent, connecting with other local people, our communities, and improving our mental wellbeing.